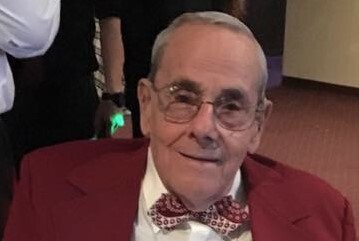 Joseph “Joe” W. Spaeth, 88, of West Bend found peace on Thursday, March 21, 2019. He was born July 30, 1930, the 5th child of the late Lawrence and Margaret (nee Melder) Spaeth in Jackson WI. On June 16, 1951 he was united in marriage to Betty Jane Tesselaar at Holy Angels Catholic Church, West Bend. Joe honorably served in the United State Army, from March of 1951 until December of 1952, during the Korean War. He worked for Weiss Hardware in Allenton for many years where he learned the art of sheet metal work. He partnered with Vince Moser from 1961 to 1974, then was self-employed until retirement. He was a member of the Fred A. Schaefer VFW Post #1393 in West Bend, the Fohl-Martin Legion Post #483 in Allenton, and the Knights of Columbus at St. Matthias in Nabob. Joe loved the outdoors, gardening, fishing, making bird feeders, and traveling with Betty. In 2015, he was chosen to go on the Stars & Stripes Honor Flight escorted by son, Steven. Joe will be dearly missed by all who knew him. Those Joe leaves behind to cherish his memory include his loving wife of 67 3/4 years, Betty Jane Spaeth (Tesselaar); his six children, Joseph C. (Mary) Spaeth, James E. (Denise) Spaeth, Diane (Martin) Jacobs, Jane (David) Gottsacker, Joyce (Keith) Beine, Steven D. (Janet) Spaeth, and daughter-in-law DawnMarie Spaeth. Eleven grandchildren, Kendra (Frank) Miller, Lynsey Spaeth, Levi Spaeth, Rebecca (Andrew) Tinlin, Christine Jacobs, Haley (Travis) Kordosky, Carly Spaeth, Seth (Heather) Dougherty, Nicole (Lucas) Lemberger, Heather (Tom Stauff) Spaeth, and Briana Spaeth; three step grandchildren, Miguel Marquez, Jose Marquez, and Jacob Carlson; 9 great grandchildren; 5 step great grandchildren; two sisters, Mildred Theisen and Irene Schellinger; four brothers, Charles (Barbara) Spaeth, Edward (Patricia) Spaeth, Lawrence (Alice) Spaeth, and Daniel (Mary) Spaeth; a sister-in-law, Donna Spaeth; nieces, nephews, other relatives and friends. In addition to his parents and parents-in-law, he is preceded in death by a daughter, Christine Spaeth; son, Jeffery Spaeth; grandson, Joseph A. Jacobs, sisters Rita (Oscar) Beder and Ethel (Joseph) Weninger; brothers, David Spaeth and Michael Spaeth; brothers-in-law, Louis Theisen and Fredrick Schellinger; and nieces, nephews and other relatives. A Mass of Christian Burial will be held on Saturday, March 30, 2019 at 12:00 p.m. at St. Lawrence Catholic Church, 4868 State Road 175, Hartford WI. The family will greet relatives and friends at the church on Saturday from 9:00 a.m. until 11:45 a.m.
Memorials to The Threshold, Interfaith, Stars & Stripes Honor Flight, St. Lawrence Catholic Church, or a charity of your choice in Joe’s name are appreciated by the family. The family would like to thank the VA, nurse Caryn, the caregivers from Right at Home for all their help and care, the nurses and doctors of Froedtert Health-St. Joseph’s Hospital, and the staff of Horizon Hospice. Thanks, also, to all the chaplains, especially Father Andrew and Father Davies, who prayed with the family.